We loved Curious Jac so much when it came in 2015 that we made sure it returned as part of our Spot On Children’s Festival this year! 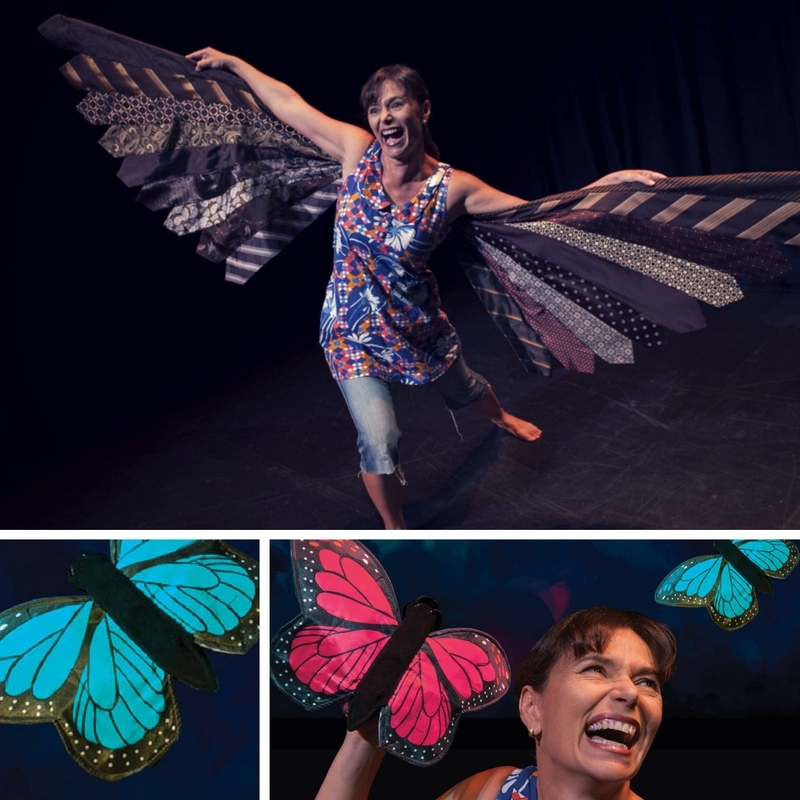 We caught up with Lilli to find out more about this captivating production and her thoughts on the importance of storytelling and children’s theatre. Plus, she shares her tips on bringing storytelling to life for your children at home. The creation of Curious Jac was a collision of a number of events. Firstly, was the fact that I have always been fascinated by the idea of curiosity. Many years ago I heard three or four different versions of the Native American Indian creation tale, Curious Woman. One version in particular celebrated the fact that she was curious. I fell in love with that version and began to notice that many institutions/traditions in our world spoke negatively about curiosity, for example, curiosity killed the cat. Secondly, I had recently returned from an international storytelling tour to Colombia and Peru. Whilst in Peru I lost all of my puppets. These were puppets that I had lived, worked, created and loved for over ten years. I posted this event on Facebook while I was overseas and seriously grieving the loss of my puppet friends. Upon my return to Australia a wonderfully generous and caring range of creative friends found, made and purchased puppets for me. One friend, Tracey, gave me a Folk Manis eagle. As soon as I put my hand in the eagle I knew he was the main character of a story. Put the two together and Curious Jac was born. The story follows a curious girl who is guided by the time eagle who has the answer to all of her questions. What will families get out of the show? What I hope families will gain is a fun shared experience. A bit of a song worm to annoy the parents for the next few weeks. A love and curiosity of world stories, language and play. Inspiration to go and play with puppets and stories and to create. What do you love the most about storytelling on stage? Being on a theatre stage means I am sharing stories in a quiet space that is dedicated to families sharing the experience. I can’t explain how much I love that. It’s different to the noisy, tiring festival and the school environments as all people including the staff, the performers and the audience have come for this one shared experience and I feel that that is an absolute honour. Tell us about the puppets and music you use throughout Curious Jac. So you know about the eagle puppet, which is the one that I primarily use. I also have a range of puppets that I give to audience members to help curious Jac tell the Indian story. They include a large prop of Anansi the spider which allows the audience to experience the West African story. The music is delicious. It is an original score created and lead by Ann Lehmann-Kuit who is a wonderful music therapist and music teacher based in the Illawarra. She worked with Alison Garvie a music teacher in South Sydney and North Illawarra and my two children Jiah and Nicola Pang. The music includes pan pipes and Charango when we tell the story from Ecuador and the classical Indian guitar when we tell the Hindi story. It also includes the djembe when we tell the West African story. We try to keep the music authentic to the region and honour the roots of the story we are sharing. They are all talented multi-instrumentalists and working with them has been like living in the perfect creative storm. The results are just beautiful. You speak a mixture of languages in the show. How long did it take you to learn these multiple languages? My mother was born in El Salvador so she is a Spanish speaker, my father was Australian born and speaks only English. So I grew up with a bit of Spanish and as a teenager I got motivated to learn more so I put in the time and effort to study and travel to learn Spanish. Becoming fluent in a second language takes a long time and I am not completely fluent in Spanish yet so I take my hat off to all those dedicated students and parents who work to keep a second, third or fourth language alive in their homes. The other two languages are minimal – just a few key phrases which I asked native speakers here in Australia to teach me. I learnt the Hindi from the Australian based storyteller Kiran Shah and the Twi from Ghana born and Newcastle based musician Afro Moses. This is the benefit of living in the diverse community that is Australia, there are so many people with so many stories and languages around us. What tips do you have for parents to enhance their storytelling with their children at home? You’ve read the book a thousand times, put it down and have confidence that you can share this story without it. Children want the time with you, the eye contact, the space to create and share…that’s what it’s all about, not the performance so give it a try – it’s addictive. I have embedded three traditional folk tales in this show (from Ecuador, India and West Africa) and we end this show with an improvised story using the words that the audience give us so there is a strong model to take home and play with. Why do you think children’s theatre is important? From a community perspective theatre and storytelling are critical. They create empathy and understanding, it creates a situation where ‘listening occurs’, where we learn about others and ourselves and find our connection to those universal elements. I think that it is important in its own right too as it gives the whole family time out of clock time. This is very important for our relationships and connection to each other. A child with their sibling share the experience, children get to share the story and the event with a parent or other family member and it creates a bond. These moments lead to a heartfelt connection, a closer connection that will stand strong against the tide of teenage years and change what occurs in the “structured” society of school and expectations. We are dealing with the grand universal concepts – the tough stuff. In this play alone we touch on self-confidence, empathy, perspective, danger, life and death. The theatre experience can open up these conversations that are sometimes hard to get going. It offers a platform to talk about death or a character to talk about bullying, or ethics, these stories and conversations are important to share. It feeds imagination. Theatre and storytelling does not provide all the images for the child in the way that television or computer games do. It provides opportunities for children to spark their imagination, practise the art of imagination and to keep that art going. Imagination or creative thinking is the key to innovation in all fields, engineering, medicine, art, design, IT, everything and creative thinking is a practice not a gift. Children’s theatre feeds this practise. Folk tales, children’s stories, children’s books they are concise engaging and wonderful things to interact with. A children’s story doesn’t babble or become over wordy. For me as the creator I am aiming for engagement. I am aiming to produce an hour of entertainment, creativity, inspiration, curiosity and sharing. I have challenges to deal with age and cognition that create a pressure point and I am doing this for a group of people who are honest, immediate and straight forward in their feedback. Any flat parts, failures in the piece and I will know immediately because kids don’t have the ‘polite’ restrictions that adults have as audience members. Children’s theatre (and literature) is well edited as a fundamental. There are education and literacy benefits that have been well studied and written about time and time again. Our brains are wired for storytelling; neurological data is supporting the fact that stories are our primary way of communicating, learning and connecting now and throughout human history. There are many other true and relevant points that have been made in articles written by people with far more experience in theatre making than me. The point I’d like to end with is that children’s theatre or children’s stories are not just for children – they are for the child in all of us. Curious Jac plays at Riverside Theatres 29 & 30 September. Relaxed performance available Thursday 29 September at 12:30pm. Click here for more information and to book.